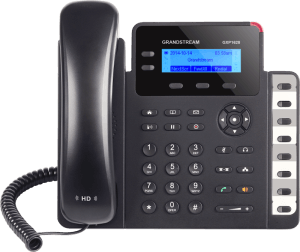 The Grandstream GXP1628 is a standard office Telephone from Grandstream. This Linux – based model offers 2 lines, 3 XML programmable keys, 8 programmable BLF extension keys HD audio and 3 – way conference. An LCD screen 132 x 48 creates a clear picture for easy viewing. The GXP1628 include dual Gigabit ports and PoE integrated network. Additional features such as multilanguage support, support Electronic Hook Switch Plantronics headset jack and call waiting allow the GXP1628 be a reliable, easy to use and high quality IP phone. Grandstream GXP1628 Dubai , a powerful IP phone best suitable for small to medium businesses (SMBs) and comprises of such high quality specs and features that can never disappoint the user. It offers an easy to use interface for its customers and proves to be a reliable and high performing phone. Some of the features of this phone are similar to the previous versions of Grandstream GXP series but with the addition and upgrade of the specs, it has increased convenience for its customers and given them a more suitable, versatile and reliable office telephone. The operating system on which GXP1628 is based is Linux, more compliant, more comfortable to use and more convenient. Featuring 2- line VOIP and offering the opportunity to have a 3- way conference call, GXP1628 provides you with a lot more convenience and comfort. A backlit LCD with a magnificent resolution of 132 x 48 pixels, you get to view easily and clearly. With extended BLF keys, you get more functions. In the previous versions, network ports were dual switched with 10 / 100 Mbps capacity but this VOIP phone has provided you with dual switched network ports having gigabit capacity that surely adds to the comfort and convenience of this phone and makes it better than the others in many respects. An HD audio, 3 keys XML programmable, supporting multi- languages, integrated Power over Ethernet feature, call-waiting and a lot many functions similar to the other phones in Grandstream series updated with an improved technology offer you the best experience in voice communication. All these features and many more are there that are offered by Grandstream GXP1628 phone that make it better than its previous versions in many regards. It remains affordable allowing the small and medium business owners to get the most out of voice communication with a high quality and reliable enterprise-level IP phone.